Through C-STEM Math-ICT curriculum, K-6 students learn math and science through building, making, and coding. 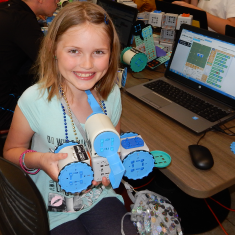 Students can quickly build their own robots by snapping Linkbot and accessories together. 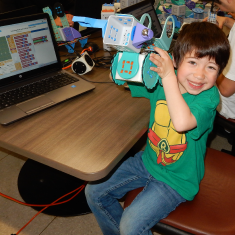 They can then readily control and program their robots using user-friendly RoboBlockly in drag-and-drop coding. (This course is currently under development). This course explores mathematical concepts in the Common Core State Standards- Mathematics through practical applications with hands-on and fun computing and robotics activities. Students write C/C++ computer programs to control a single robot and multiple robots. Through both personalized and collaborative group computing and robotics activities, students learn and reinforce the algebraic thinking with arithmetic operations in whole and decimal numbers, number line, fractions, measurement, variables, data conversion, lines, angles, ratios, proportions, and linear relation. The hands-on computing and experiments help students make meaningful connections between abstract math concepts and their relevance to real-life applications, as well as help develop students’ critical thinking and problem-solving skills.